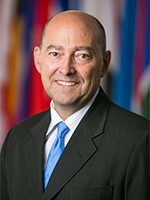 We are pleased to welcome Admiral James Stavridis as the Chair of McLarty’s Board of Counselors. Admiral Stavridis is Dean of The Fletcher School of Law and Diplomacy at Tufts University, and one of the most prominent and celebrated public voices on national security affairs. He is a retired 4-star naval officer who served most recently as NATO’s Supreme Allied Commander and before that as head of the US Southern Command covering Latin America. Admiral Stavridis has also written numerous books and articles for leading publications worldwide. Currently, he writes a monthly column for TIME Magazine, and is Chief International Security Analyst for NBC News. Admiral Stavridis announced last week that he will be stepping down as dean of Fletcher in August after a successful five-year term. In addition to serving as Chair of McLarty’s Board of Counselors, he will join The Carlyle Group as an Operating Executive. In his work with MA, Admiral Stavridis will offer board of directors and C-suite briefings to our clients, and assist them in understanding the volatile and changing circumstances of the world in which we live. We look forward to introducing him to our McLarty team and to our clients in the weeks and months ahead.